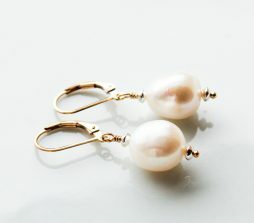 Classic design womens earrings with White freshwater Pearls. Baroque Pearls gold filled earrings. Small leverback earrings. Bridal jewelry for her. Earrings are 1.5″ in total. Gold filled lever back closure. Baroque style freshwater Pearls, 11-12 mm big, organic shape, AAA quality and beautiful white color. Earrings have small sterling silver beads on both sides, as a nice contrasting accent. Visit EverywhereUR on Facebook, Pinterest, and Twitter, and say 'Hi'!